*Life in Miniature*: Etsy Treasury: Tic Tac Poe! Etsy Treasury: Tic Tac Poe! Etsy Treasury: I heart books! August AIM Magazine now online! Boy, when it rains, it pours! Another fabulous Etsy treasury to include my books - this one is by Theresa of Faerie Moon Creations (faerymoongoddess on Etsy), titled "Tic Tac Poe!" 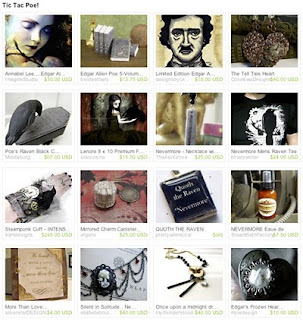 Theresa included my Edgar Allen Poe miniature book set, along with other Poe-themed art and jewelry by Etsy artists. Elegant and spooky! 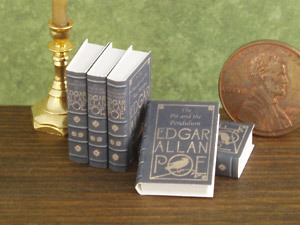 You can purchase the miniature Poe books on my website or in my Etsy shop! Estupendo trabajo de imprenta y encuadernación. Enhorabuena.